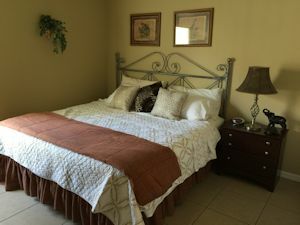 Enjoy your Florida Disney vacation in our beautifully decorated, 1800 sq. ft. luxury home, complete with an optionally heated, private pool and spa. This home is located right next to the grassy park, in a newer section of Indian Creek, where there is playground equipment for children. 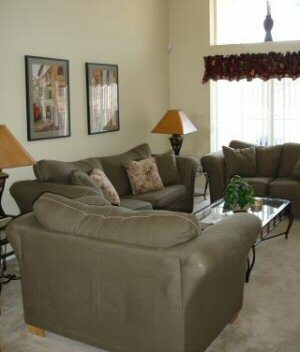 Our beautiful home has all the amenities that you could ask for in a vacation home. 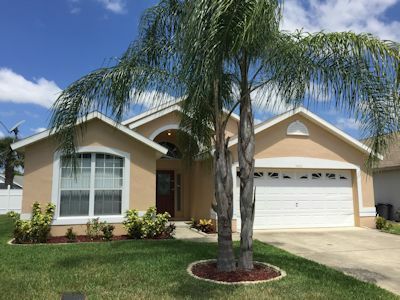 This home has central air conditioning, heating and ceiling fans throughout. 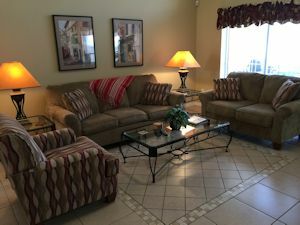 All the comforts of home and just 3 miles from the excitement of Disney! You'll never want to stay at a hotel again! The living room has a larger Cable TV with DVD and VCR. Your children will feel right at home with a Play Station II and games. High Speed Internet Service cable is in the living area. There are numerous books, videos and board games. 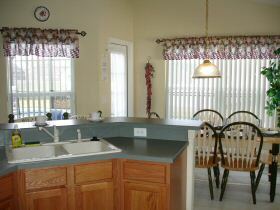 The large, fully-equipped kitchen is complete with a microwave and dishwasher! The home's layout is perfect for watching the fun going on in the pool area from the living room, dining area and kitchen. 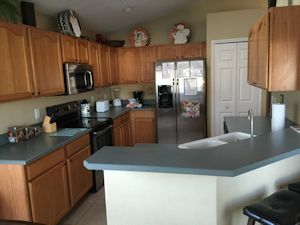 The fully equipped kitchen offers everything you need to feel at home; a coffee maker, cookware, plates, glasses, and silverware. There is even a fully-equipped laundry room for your use, complete with an ironing board and iron! This beautiful villa has 4 Bedrooms & 3 Bathrooms. 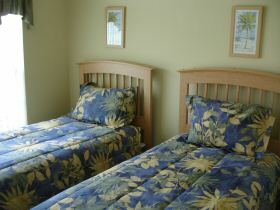 2 Master King Suites, each with their own private bathroom. Both great luxurious "get-a-ways" for some relaxing! There is a growing selection of books to read! Every bedroom has its own TV & VCR. 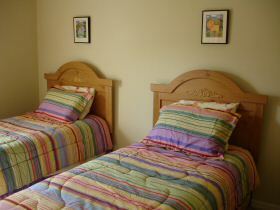 The 2 twin size bedrooms share an adjacent full bathroom. Perfect for the children in the group, or an extra adult or 2. This villa is spacious enough for two families with children. Comfortably sleeps 8. It can accommodate 10 people with the queen sized sofa sleeper in the living room. 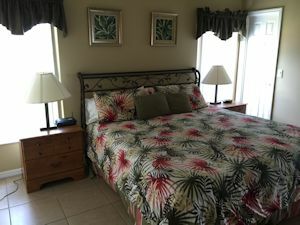 Each bedroom has its own cable TV and VCR. We also have available, at no extra charge, a stroller, portable crib and highchair for infants. 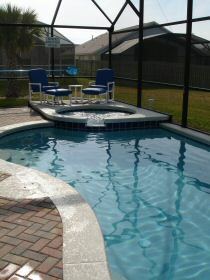 Relax in the private, south-western facing pool and spa, after your long day at the theme parks! The rear yard is fully fenced with a 6 foot privacy fence. This home offers an extra large lot with plenty of running room for the kids. 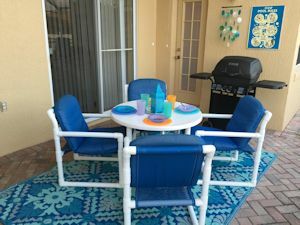 The covered Lanai is complete with deluxe patio furniture, a safety screen, and alarms on all the access doors, for your small children's safety. 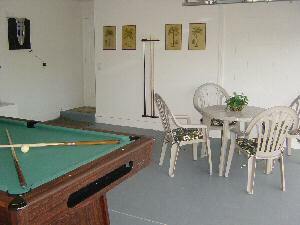 We also offer a games room with a standard pool table, electronic dart game, and a card table and chairs.